I purchased my Musgraves from Pencils, Etc., an Amazon seller located in the Shelbyville area that I assume to be Musgrave or someone affiliated with them. I’ve never seen either of these pencils for sale anywhere else. Pencils, Etc. sells their goods for $16 / 3 dozen, which is a respectable price, and comparable to General’s Semi-Hex pencils purchased directly from the manufacturer. I bought two lots: Musgrave’s “909 Ceres #2”, and some plain, unmarked black round #2 pencils. The pencils came packaged in plastic bags, in typical “bulk lot” fashion. I eagerly tore them open and sharpened up a few. They sharpened well, for non-cedar pencils (probably basswood), and both are well worth the money I spent on them. 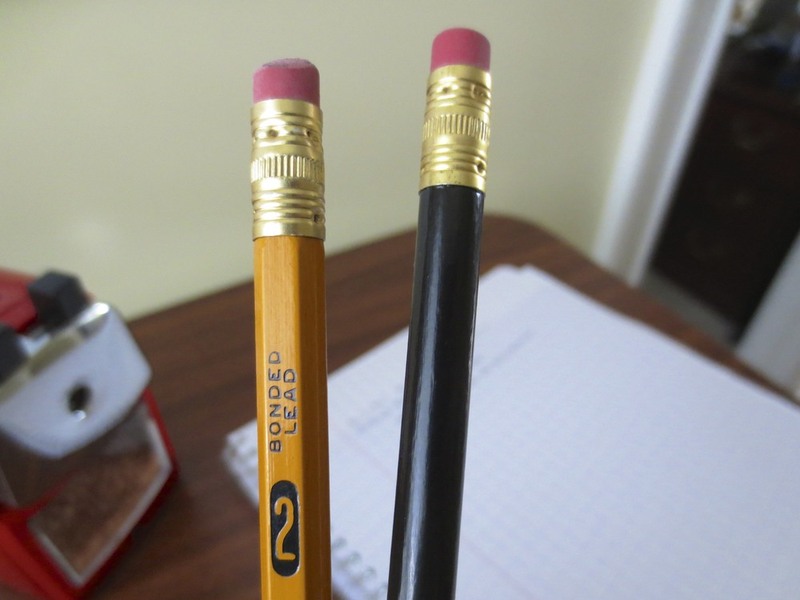 They both have the same pink eraser that works well, and that I would compare to a Pink Pearl. Top: The Musgrave Ceres 909, their standard #2 pencil, proudly marked as made in "Pencil City," USA. Bottom: Basic Black #2 pencil. Nothing fancy about this packaging, but it gets the job done. 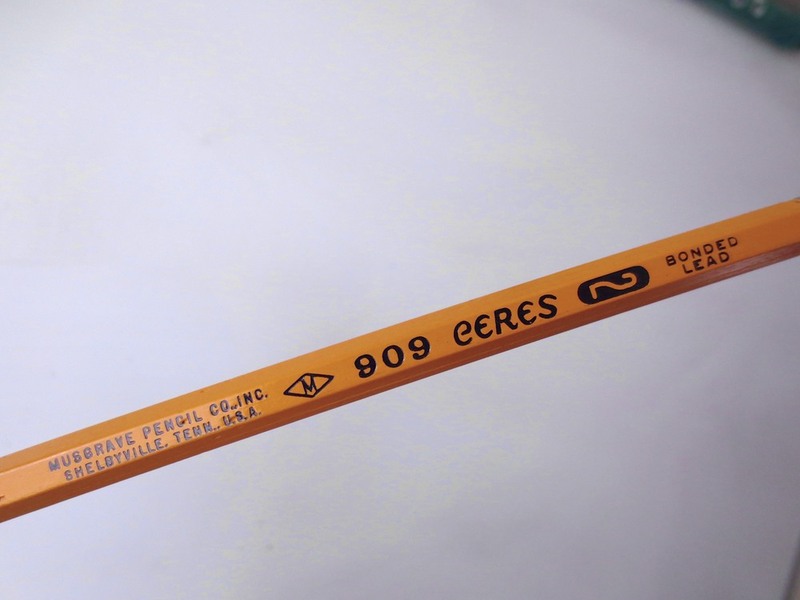 The 909 Ceres appears to be Musgrave’s basic yellow #2 pencil, and if that’s what you’re looking for it’s an excellent option. The core is quality, and sharpens to a nice point. I would compare this pencil to the new, Musgrave-manufactured Palomino Golden Bears. The pencils have the same sharp ridges as the new Golden Bears, and are not rounded for comfort as are most modern hexagonal pencils. Some people don’t mind this, but I’ve found that it makes it difficult for me to write with these pencils for long periods of time. Point retention on the Ceres is excellent. The lead is dark, but as I’ll note below, I prefer the softer, even darker lead of the unmarked rounded pencil. 909 Ceres writing sample on Clairefontaine Seyes-ruled paper. For lack of a better term, I’ll dub these pencils the “Basic Black” model. When I purchased these a month or so ago, Pencils, Etc. offered these in multiple colors (and you can probably find an even broader selection if you reached out to Musgrave directly). I’m a sucker for round pencils, and always have been. I find them far more comfortable than their hexagonal brethren, even if you have to worry about them rolling off the desk. What really kills it for me, though, is the core. It’s labeled as a #2 pencil, but it’s ever-so slightly softer and darker than the Ceres, while maintaining most of the point-retention properties. As you can see here, the core of the Basic Black Musgrave pencil (bottom) is just a hair darker than the 909 Ceres, and it's also smoother. Basic Black Musgrave writing sample. The comfort combined with the dark core makes this pencil a nearly perfect daily writer for me. In the first picture, you can see the difference between the Ceres (shown up top), and the Basic Black. Sorry Ceres, but I’ve found myself reaching for the Basic Black whenever I need to do more writing than jotting a few quick notes. I’m glad I have three dozen! Once Musgrave gets their store up and running, I’ll consider buying more and maintaining a stash of these.